Photo: Holly St. John Bergon. rank Bergon is a critically acclaimed Nevada novelist and scholar of Basque heritage. He was born in Ely, Nevada, in 1943, but moved to the San Joaquin Valley, California, when he was very young. He is currently a professor at Vassar College, New York State. Despite his Basque identity, his books, articles and visits to the Basque Country, he is not very well-known among European Basques yet. This lack of acknowledgment is unfortunately something that largely affects the Basque diaspora scholars and writers. Bergon’s maternal grandparents left Bizkaia to head for a better and more prosperous future, as did many other Basques, around the turn of the last century. They travelled overseas and crossed all North-America to find a home. Bergon’s grandparents established themselves in the American West, where they had eight children. One of these children was Bergon’s mother. As Bergon claims, his parents’ generation wanted to put their European past behind them. That is one of the reasons why neither his father nor mother ever visited Europe. They wanted to be Americans, and they wanted him to be an American too. Although Bergon remembers his grandmother speaking Basque to his mother, he was raised in English, just as many other children of Basque heritage. Bergon did, however, learn some Basque and Spanish words from his grandmother, but he claims that the strongest identity with Basque culture for him was through food - his grandmother’s cooking and the Basque Hotels. As a matter of fact, the Basque Hotel in Fresno, California, was the meeting point for his family. As a child, Bergon observed men from the Basque Country playing pelota in the fronton of the hotel and he heard them speak Basque as they all sat at the long boarders’ table. As opposed to his parents’ generation, Bergon has visited and revisited the Basque Country frequently. His primary relationship is with his relatives in Bizkaia. They have become close and they are in touch in this age of e-mail. 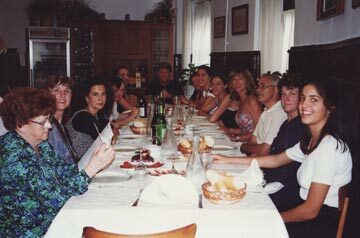 Bergon feels an integrated part of his European Basque family, as well as of the Basque culture. 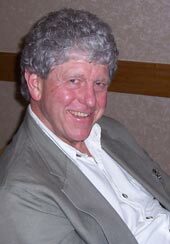 He has taught some Ph.D. courses at the University of the Basque Country and he was one of the key speakers in the 2005 congress, The American Literary West, held in Gasteiz, at the same university. 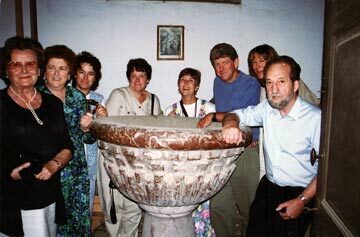 At the baptismal font of Frank Bergon’s grandfather, Esteban Mendive Aurtenechea, in the church of Ajangiz overloooking Gernika. At the far right is Bernardo Arrizabalaga, author of the novels Los Barroeta and En principio era el roble. Both the discovery of his Basque identity as a child and the attachment he feels towards the Basque Country have marked his fiction. Bergon’s three novels, Shoshone Mike (1987), The Temptations of St. Ed and Brother S (1993) and Wild Game (1995), focus on the Basques in the North-American West. The three books convey an interesting illustration of their experience in a new country from the first to oncoming generations. Bergon’s portrait of the presence of the Basques in the American West is an enlightening description of the relevance of these figures in this part of the world. Bergon’s fiction has beautifully captured how the American West has shaped the Basques, just as the Basques have shaped the West. Bergon’s three novels offer an interesting development line that could be summarized in the original use of the term “Basco” as derogatory, to the same term expressing Anglo-acceptance and Basque ethnic pride. The representation of this development is a novelty not just within Western American fiction, but also within Basque-American Literature, and European Basque literature itself. Few novels or writers, besides Robert Laxalt and Bergon himself, have compressed such an extensive rite of passage of the Basque-American community so far. Fortunately, there are more and more voices that are enriching the Basque-American culture, as is the case of other third-generation Basque-Americans writers, such as Monique Laxalt, author of The Deep Blue Memory (1993), or Martin Etchart, whose novel The Good Oak (2005) has been recently translated into Spanish. Frank Bergon with his relatives in the Hotel Vega in Markina. Bergon’s novels are a significant illustration of how people that had to emigrate managed to start from scratch and still keep pride and interest in their Basque identity. As his three novels mirror, the pride for their ethnicity has been recuperated -although some debate if there was initially any ethnic pride- by the children and grandchildren of the emigrating Basques. The main character of the novel Wild Game, Jack Irigaray, represents the interest and the effort that many Basque-Americans that may not even speak Basque nor Spanish are making in order to instil and transmit pride for what conveys their identity. It is thanks to such efforts that the Basque identity is still alive in the American West and has not just simply blended in the “melting pot”. Jack Irigaray represents many of the Basques who were not raised with an awareness for their Basqueness, as is the case of Bergon himself. As Jack explains, when he was younger he grew up ignoring his Basque heritage; he grew up being just an American. He claims that “they were all just Americans, not even hyphenated ones” (Bergon 1995: 3). Conversely, his two young daughters, “who sang Basque songs and danced the jota at the Zazpiak Bat Club, were more conscious of their ethnicity” (ibid.). This ethnic awareness has been translated into the hyphenated term “Basque-American”, which is how the hybrid identity of Basques born in the United States is expressed without conflict. 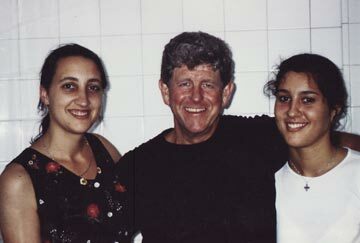 Frank Bergon with his cousins Andrea Noya Arrizabalaga and Beronika Noya Arrizabalaga. In his attempt to mirror the American West as real as it is, Bergon also includes characters of Basque heritage who are disassociated with their Basque identity, or it is a least an invisible feature in them. Such is the case of the abbot St. Ed Arrizabalaga, the main character of The Temptations of St. Ed and Brother S. St. Ed shows no concern or interest towards his Basque identity, which would thus represent those Basques who have chosen to be fully American, or at least not Basque. He could also represent those who do not feel the need to publicly manifest their Basqueness or ethnic awareness. Bergon does not focus on the reasons of the different manifestations and layers of Basqueness, but the inclusion of figures such as Jack Irigaray and St. Ed Arrizabalaga provides a broader perspective of the diversity of Basques in the American West. Bergon’s fiction thus serves as the expression of the mosaic Basque community. This article also highlights Frank Bergon as a representation of the enduring legacy of the many Basques that left their homeland for an opportunity in the American West. The hard work of the immigrant parents to give their children more possibilities than those they had been given has translated into energetic younger generations that are willing to share with us part of our history, the Basque history, and its ongoing transformations. Bergon’s novels are also an interesting glimpse of the different ways of being Basque outside Euskal Herria. Bergon, Frank (1987): Shoshone Mike. New York: Viking. ---------------- (1993): The Temptations of St. Ed and Brother S. Reno: U of Nevada P.
---------------- (1995): Wild Game. Reno: U. of Nevada Ps. Etchart, Martin (2005): The Good Oak. Reno: U. of Nevada P.
Urza (Laxalt), Monique (1993) : The Deep Blue Memory. Reno: U. of Nevada P.